If you didn't make it to The Photography Show this year, we're really sorry to have missed you. 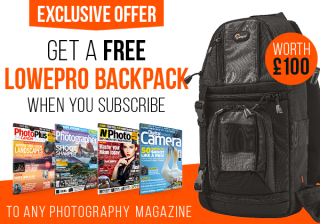 We don't want you to miss out on our fantastic show offer, where we gave away a Lowepro bag worth £100 with every photography magazine subscription, so we're extending the offer for a limited time to UK residents! Subscribe to your favourite photography magazine from as little as £45 a year and you'll receive the brilliant Lowepro Slingshot 102 AW Photo Sling Pack. What's more, opt for a Premium subscription and you'll also save up to 65%! Previously a Photography Show exclusive, the Lowepro Slingshot 102 AW is far and away the best small bag offer we've ever had. A fantastic, practical camera bag that has been designed by actual photographers, it boasts a seatbelt strap for quick 'sling' access. It's discreet and compact, yet big enough to accommodate a DSLR. The main space provides space for a camera with lens plus a pair of accessories, such as an extra lens and flashgun. There are plenty of pouches for memory cards, batteries and your phone, plus there's a quick-access weatherproof cover for when the weather turns. Don't delay, though – this extended offer is only available while limited stocks last, so click the link below if you want to get a free bag as well as great savings!